Seeing potential in their unfinished second-story attic, the homeowners reached out to designer Lisa Albers to convert the space into a master bedroom and bathroom retreat. “They intended to finish the project on their own but soon became overwhelmed by the volume of decisions and choices involved with finishing a cohesive remodeling project,” Albers says. 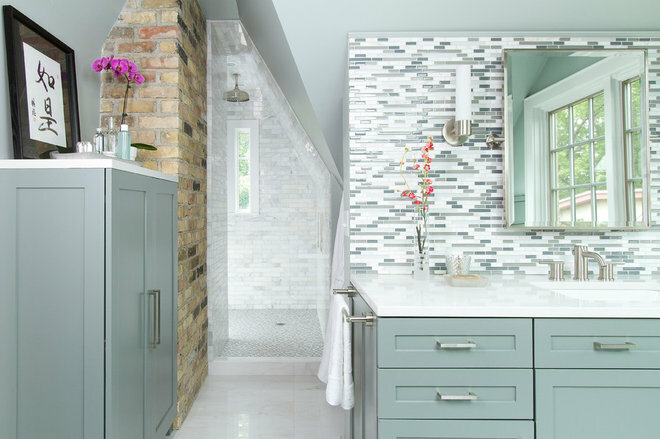 The designer helped the homeowners narrow down their options and select finishes to create a soothing spa-like escape complete with ceiling eaves, custom built-ins and an exposed brick chimney. Albers designed a custom wood surround for the undermount bathtub. 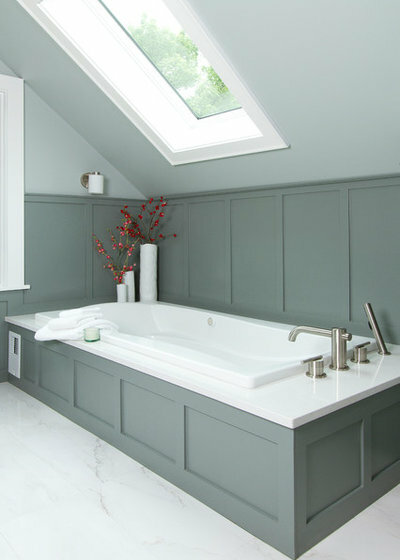 A new skylight above the tub brings in natural light during the day and allows for a view of starry skies at night. Custom wainscoting on the walls is painted in Benjamin Moore’s Duxbury Gray, a soothing color that has shades of blue, gray and green mixed in. 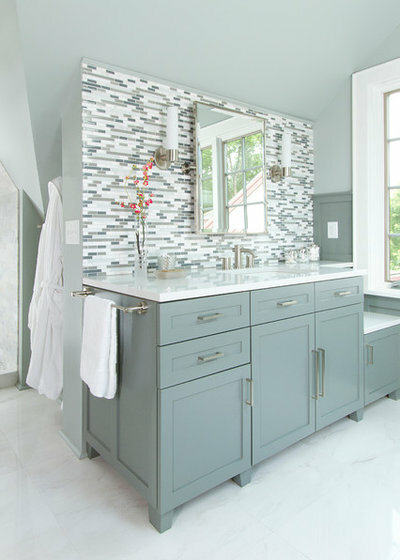 Albers says the design of the house is traditional but features many contemporary interior finishes, so a mix of traditional cabinetry and wainscoting with modern light fixtures and a glass tile backsplash helps connect the master bathroom to the rest of the house. The vanity countertop and seat next to the window are topped with Silestone quartz with sparkly flecks. The floor is a porcelain tile designed to mimic the look of marble. Albers slipped the shower in between the eaves and the existing brick chimney. 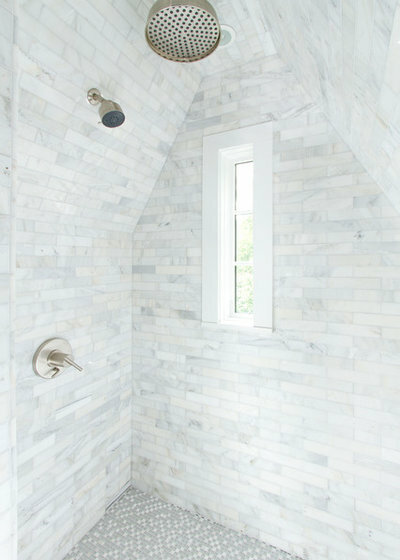 The portion of the chimney inside the shower was covered with Carrara marble tiles, as were all of the shower walls. The shower floor is a smaller white porcelain tile. Albers added a small window to the shower to draw in natural light. The shower features both a traditional shower head mounted on the wall and a rainfall shower head on the ceiling. Because of the unique shape of the shower, the glass door had to be custom made.